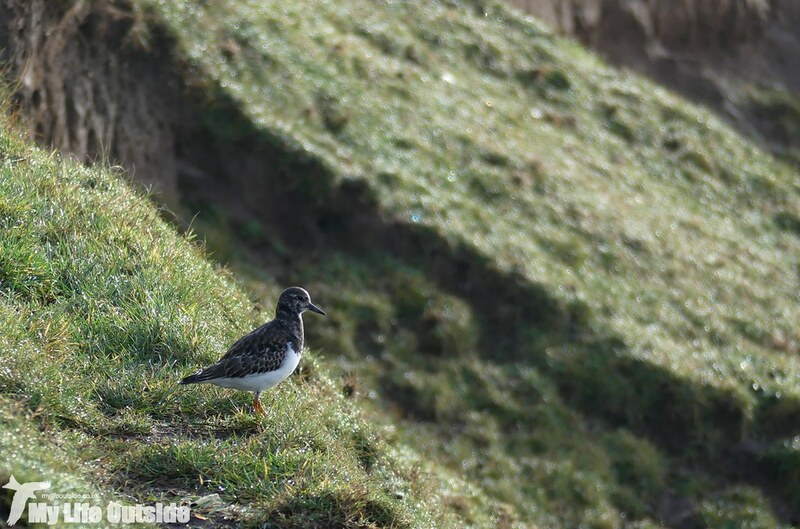 Goldeneye and Ogmore. Two words which go hand in hand at this time of year and with my parents down weekend before last we had the perfect excuse to go and see how numbers were building. 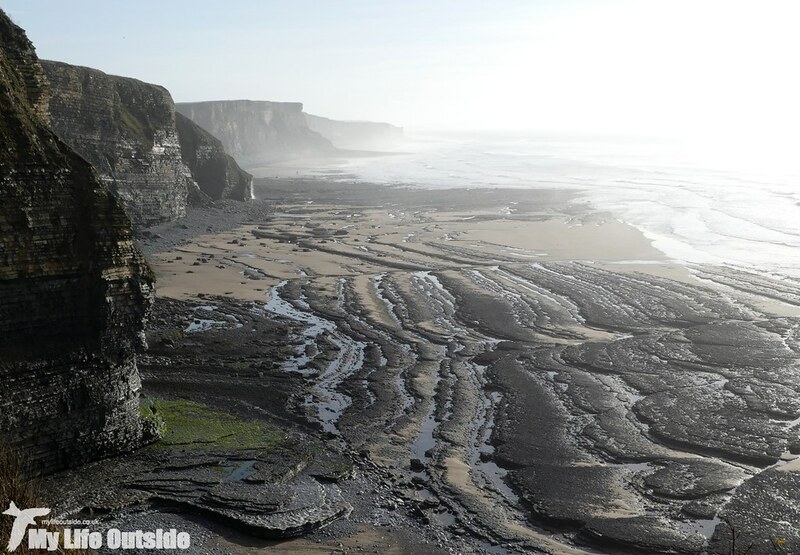 The plan was to do a circular walk along the coast from Ogmore to Dunraven before cutting inland and following the river back to the car. It’s a route we’ve done several times previously and somehow it always manages to throw up a surprise or two whether that be truly spectacular blowholes or my very first Red-necked Phalarope. In the end we could produce nothing quite so dramatic this time out but the river did hold a small group of Goldeneye consisting of two males and two females. The former were clearly feeling a little frisky with occasional bursts of display behaviour witnessed. Sadly with the tide high and birds suitably wary they never came quite close enough for killer photos but even at distance made for a nice grouping as the sun sank behind the hills. Also present was a stunning male Goosander, my first for some time, as well as the usual assortment of bickering Redshanks, Teal, Pied Wagtails and an occasional Cormorant fishing up from the coast. It was nice to see several Gadwall here as well, a vastly underrated species whose intricate plumage is too often dismissed as just another dull duck. At Portobello gull numbers reached well into the hundreds but only a lone Great Black-backed stood out from the hoards of Herring and Black Headed though all made for a dramatic sight as they periodically took to the air as one. With temperatures reaching double figures I fear this is as close to a blizzard as I’m likely to get this winter! The first of these displays was caused by a passing Sparrowhawk with the second resulting from a horse at full gallop along the opposite bank. Looks fun but I’m afraid memories of nursing a bruised bum from my last time in the saddle preclude me from extolling the virtues of horse riding further. Along the coast between Ogmore and Dunraven we were treated to all the regulars including a small group of Oystercatchers which seem to have made the car park their home and, more unusually, a pair of Great Crested Grebes fishing close in to shore. With the sea an almost flat calm we enjoyed fantastic views so it was unfortunate that passage was rather sparse. 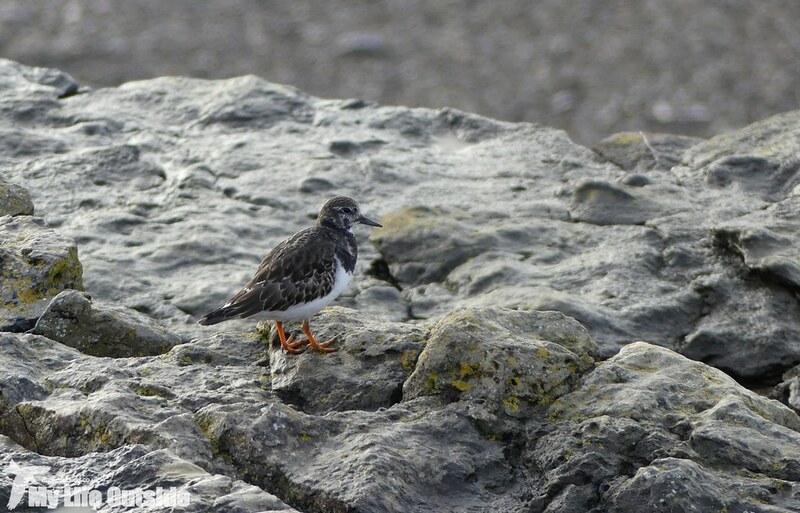 If I was to name a ‘bird of the day’ though it would have to be this Turnstone which we spotted on the path initially before hopping down to the rocks to continue its feeding. I just love the character of these birds as whenever you’re photographing one there’s always that sense that you’re being toyed with. I’ve written before about the sad loss to history of Dunraven House but its foundations proved an ideal location for a spot of lunch in the company of two Ravens and another distant Sparrowhawk. Slightly closer was a calling Buzzard which passed overhead on its way to see off an intruding rival whilst the odd Stonechat or two was never far away. One thing I definitely hadn’t been expecting to see was a Red Admiral on the wing yet down in the woods that was exactly what we got. A pristine example fluttering through the lower canopy in the middle of December? The new norm I think.